I’m so happy and honored to guest post on Kathy Gotteberg’s brilliant blog – Smart Living 365 where she explores ideas and experiences that help to create a meaningful, sustainable, compassionate and rewarding life for herself and others. Her posts on awareness and well-being are always worth reading. I love how Kathy combines her personal experience with plenty of well-researched information. Gratitude is something that is very close to my heart and I know that it is for Kathy too. In fact she undertakes a regular Gratitude Challenge, so it seemed natural to write a post on the subject. As I’m cooking the spinach this afternoon I inhale the lovely scent of cumin and coriander and I give thanks for the gift spices. Earlier this morning, it was thanks for the freshness of the aloe vera soap I used in my shower. I start to think about how offering thanks has become such a part of my everyday routine. I think of my journey into gratitude and decide that I’ll share it with you today. At 41, after a series of failed romances and consequent heartbreak and disappointment, I met José and before too long we were married. Life should have been wonderful. But as we settled into married life, we met with one mishap after another. In the space of three years, we faced a minor home invasion, a huge home renovation project that went off the rails for a while, two severe bouts of malaria apiece, two cataract surgeries for me and an accident resulting in a hip replacement surgery for José. Oh, and let’s not forget to mention care-giving my mother after a stroke and my brother after his heart surgery! To read the complete post go here. I always enjoy the quotes you post. Thanks for inspiring us. 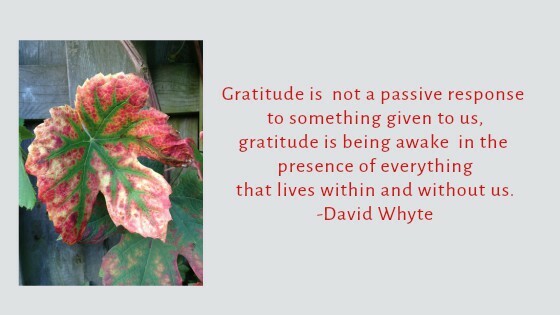 Corinne, my entire life changed when I opened my heart and made gratitude a daily practice. This is such a good post. You are one of the most generous bloggers I’ve ever known and I am grateful for YOU. Thanks, Vishal. It does, indeed!